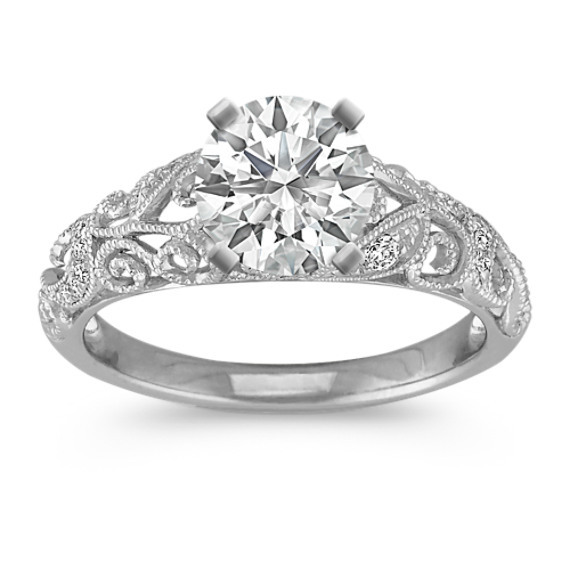 Vintage Diamond Engagement Ring with Pave-Setting in 14k White Gold | Shane Co. This intriguing vintage inspired engagement ring holds 16 round pavé-set diamonds, at approximately .09 carat total weight. Crafted in quality 14 karat white gold, the intricate milgrain and engraved detailing are simply breathtaking. Add the center stone of your choice to complete this eye-catching look. Gemstone Carat Weight :.09 ct. t.w. I'm not a big fan of clustered diamonds. My fiance did a fabulous job selecting this vintage ring. It's so beautiful and the detailing is so unique. I get complimented all the time on it! I love love love my new engagement ring!!! I put together and ordered exactly what I wanted and it came so fast!! The ring is beautiful and the price was half of what I would've paid anywhere else!